Tintri, a networking start-up from Silicon Valley, made its initial public offering (IPO) on June 30,2017 and its shares are now trading on NASDAQ under the symbol 'TNTR'. The IPO raised approximately $60 million for the Mountain View, California-based company – a lukewarm Wall Street response considering earlier speculation that the shares might debut in the range of $10.50 to $12.50. Many expected the IPO to occur at the start of last week and at the higher price range. It was not clear why the IPO was delayed by a few days, but the lower price must have caused consternation for early investors and employees. Post IPO, Tintri, which means 'lightning' in the Irish language, currently has a market capitalisation value of about $225 million. Tintri was founded in 2008 by Kieran Hearty, who had previously led engineering at VMware, and Mark Grittier, who had previously worked on software engineering at Sun Microsystems. The first products were introduced nearly 3 years later in March 2011. In August 2015, Tintri raised a $125 million Series F funding round led by Silver Lake Craftwork and included existing investors Insight Venture Partners, Light speed Ventures, Menlo Ventures and NEA. In December 2016, Charles Giancarlo, the former CTO of Cisco Systems, joined the Tintri board. Tintri prides itself of having developed an enterprise cloud platform with a 'Lego-like' design that allows for every storage action at the individual virtual machine level. The value proposition is simple: scale the enterprise cloud from terabytes of storage to multiple petabytes as efficiently as possible. 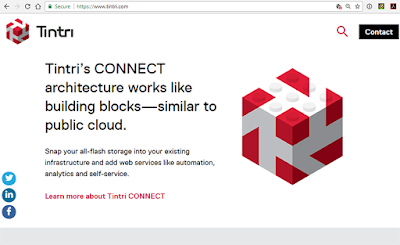 The Tintri CONNECT web services architecture use the 'Lego' building-block approach predicated on REST APIs and VM and container level abstraction. The frameworks runs applications on resource pools that span VMware, Citrix,Microsoft and OpenStack. This supports a DevOps model, where resource can be spun up or torn down on-demand, including via automated bots or modern interfaces such as Slack or Amazon's Alexa. To deliver this, Tintri's platform integrates cloud management software, web services and a range of all-flash storage systems. A key ingredient is a virtualisation-aware file system that allows an organisation to view, manage and analyse application performance and quality of service. In a sense, it enables a private version of a public cloud. Use cases include server virtualisation, virtual desktop infrastructure, or VDI, disaster recovery and data protection, and development operations, or DevOps. Tintri says it has an advantage because innovation in storage has lagged and lacked granular level operation at the VM and container level. Marquee customers include AMD, F5 Networks, GE, NEC, NTT, MillerCoors and Time Warner. The company has more than 575 employees, over 1,300 customers, including 21 of the Fortune 100, 9 of the 16 largest U.S. federal government agencies and multiple cloud service provider customers. In 2015, it had revenue of $49.8 million, a net loss of $69.7 million, and gross margin of 56%; for 2016, revenue was $86.0 million, net loss $101.0 million and gross margin 63%; for 2017 its revenue was $125.1 million, net loss $105.8 million and gross margin of $65%. Accumulated deficit as of January 31, 2017 was $338.7 million. In enterprise networking, it is safe to say that every vendor has been moving toward cloud or hybrid cloud solutions for some time. For Tintri, though it may have been early to foresee the need for enterprises to rapidly scale their storage in a cloud-friendly way, there is now strong competition from both the larger, multinational vendors and a wave of nimble competitors from both the software and storage fields. Key competitors include the following. Nutanix offers hyperconverged appliances combining compute, storage and networking. This is a different approach to software-defined storage that appeals in many similar use cases. For a size comparison with Tintri, Nutanix recently reported Q1 2017 revenue of $191.8 million, up 67% year-over-year. Dell EMC, which can be considered the king of storage and file management, with the newly combined company pulling together the full picture of hybrid enterprise cloud IT, including security. NetApp has been delivering enterprise storage and file management solutions since 1992. In December 2016, NetApp agreed to acquire SolidFire for $870 million in cash, significantly more than the current market capitalisation of Trintri. SolidFire specialised in all-flash storage systems for next-generation data centres. Its distributed, self-healing, webscale architecture also promise seamless scalability, white box economics, and radically simple management. This enables customers to accelerate third platform use cases and webscale economics. SolidFire was recognised as an active leader in the cloud community with extensive integrated storage management capabilities with OpenStack, VMware, and other cloud frameworks. In May 2017, Hewlett Packard Enterprise agreed to acquire Nimble Storage, a supplier of predictive all-flash and hybrid-flash storage solutions, for $12.50 per share in cash, representing a net cash purchase price at closing of $1.0 billion. In addition to the purchase price, HPE also agreed to assume or pay out Nimble's $200 million in unvested equity awards. Nimble offers midrange flash storage solutions featuring an intelligent, predictive analytics engine that assesses performance issues across the full data path, from apps to the array. In addition, Nimble has recently introduced multi-cloud storage services that combine the best of on-premises and public cloud storage capabilities for hybrid IT deployments. Nimble, which is based in San Jose, California, was founded in 2007 and has approximately 1,300 employees worldwide. The company delivered revenue of $402 million in its most recent fiscal year, up 25 percent year over year. HDS, which traces its roots back to Itel, an early player in the mainframe market, is also based in Silicon Valley. The company offers increasingly sophisticated file management technologies. In 2015, IBM announced plans to invest $1 billion over the next five years to develop next-generation technologies for software-defined storage. IBM intends to focus this investment on R&D of new cloud storage software, object storage and open standard technologies including OpenStack. The IBM Spectrum Storage portfolio, which already incorporates more than 700 patents held by the company, will be directed toward helping enterprises transform to a hybrid cloud. In 2013, VMware acquired Virsto Software, a start-up offering software for optimising storage performance and utilization in virtual environments. Virsto, which was founded in 2007 and was based in Sunnyvale, California, developed a storage hypervisor that 'does for storage what the server hypervisor did for servers'. Last month, Pure Storage, which is known for its all-flash arrays, unveiled its vision for multi-cloud data management. This system also promises support for VMware VVOLs, Microsoft ODX, Docker Persistent Containers, native data protection integration with public cloud providers, and pre-validated FlashStack.